let me start by saying that in recent times i have become a stationary fanatic. i guess it started with my own endeavors into printmaking (see: blue | print), but i have developed a great deal of respect for well-designed, paper goods (i.e. : expect to see a great deal of posts about wedding invitations). i especially love handmade stationary and anything letterpressed. bird and banner, a team of two women graphic designers, is by far my personal favorite. they offer less traditional invitations that often incorporate such handmade craft elements as sewn and embroidered embellishments or using fabric in place of paper, and often they hand-write the text into the design. 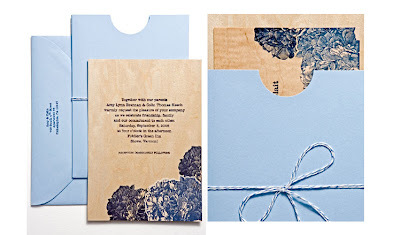 they also incorporate personal aspects of each wedding into their designs: for a wedding in philadelphia (the city of brotherly love), they used a heart shape that seems reminiscent of a handcut valentine card, and for the above hydrangea image for a wedding in vermont, they printed directly onto maple wood. but however craft-inspired their ideas, their execution is flawless leaving you with the impression that you are holding something precious that deserves to be treasured.